How do you get one Foil in a whole Box?! 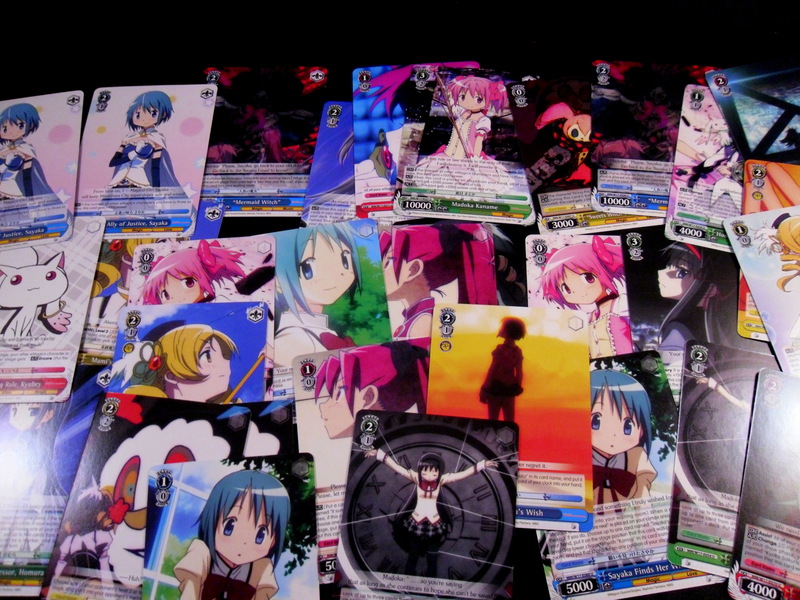 Abysmal Weiss Schwarz Box Opening! 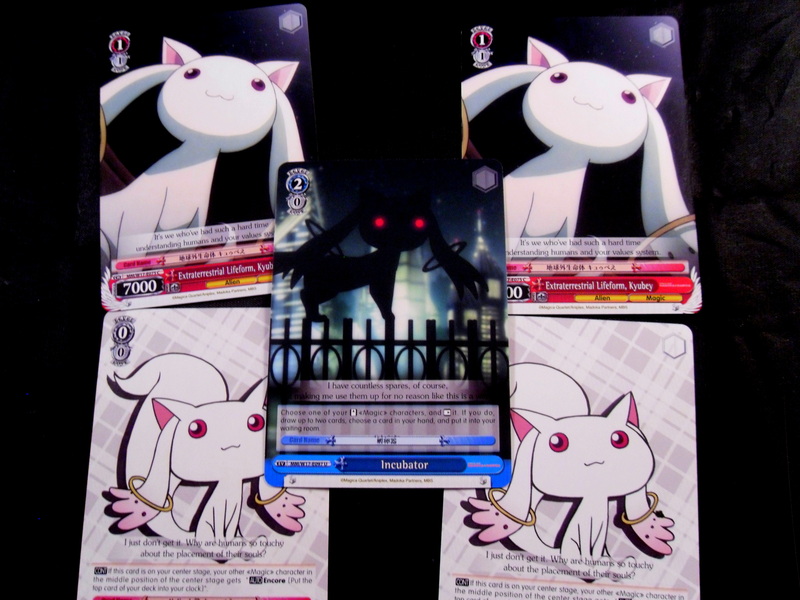 In lieu of Crossed Souls, I purchased a Weiss Schwarz box this month to supplement the Madoka Trial deck I bought way back in February. Madoka is one of my favorite shows. 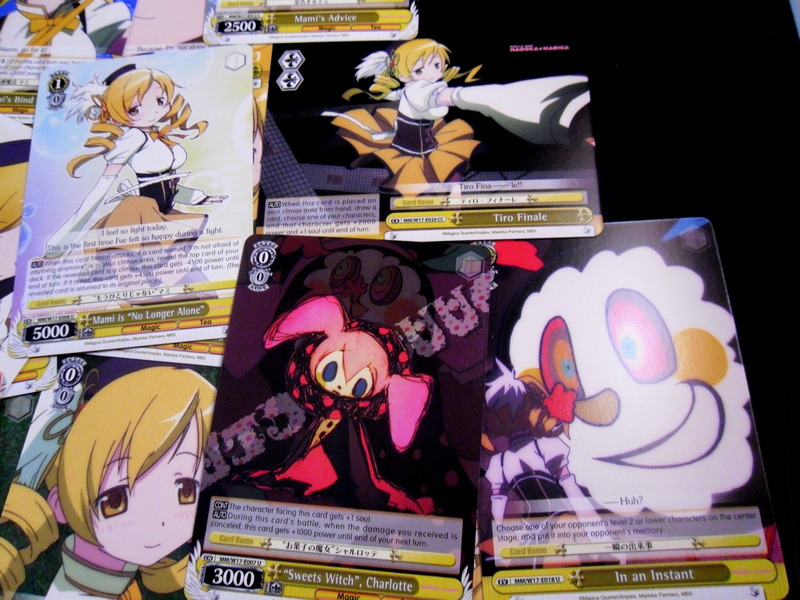 Thus, I couldn’t resist getting the cards when I learned they actually existed. 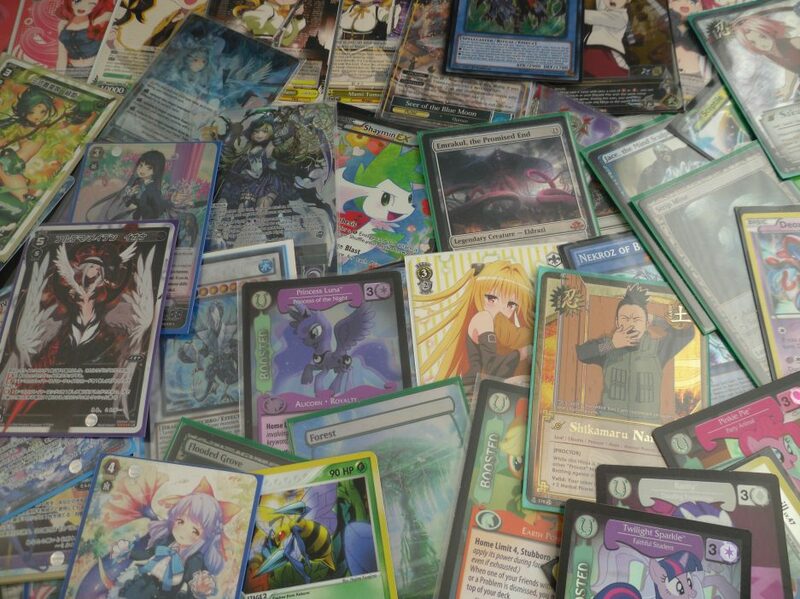 I was buying Yugioh sets so frequently though I completely forgot to look into this game. 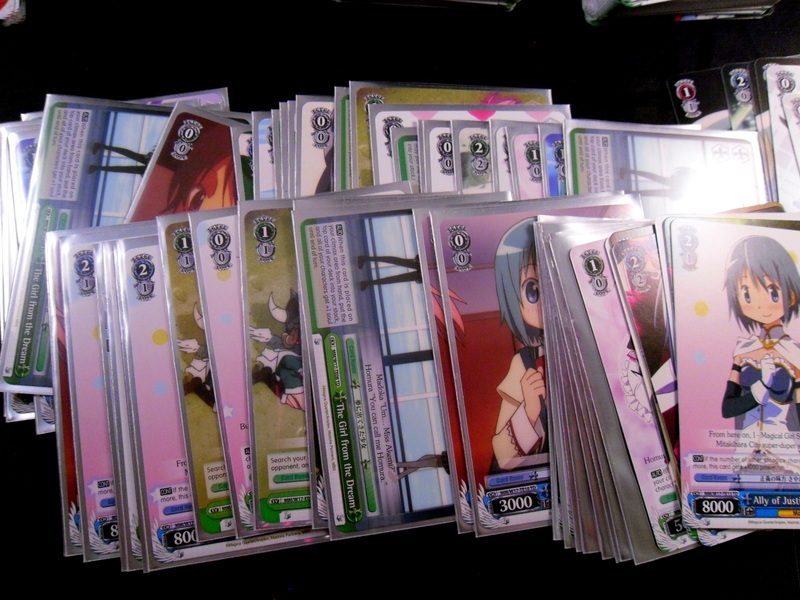 However, as a break from the typical card games (Yugioh and Magic) this turned out to be really awesome. 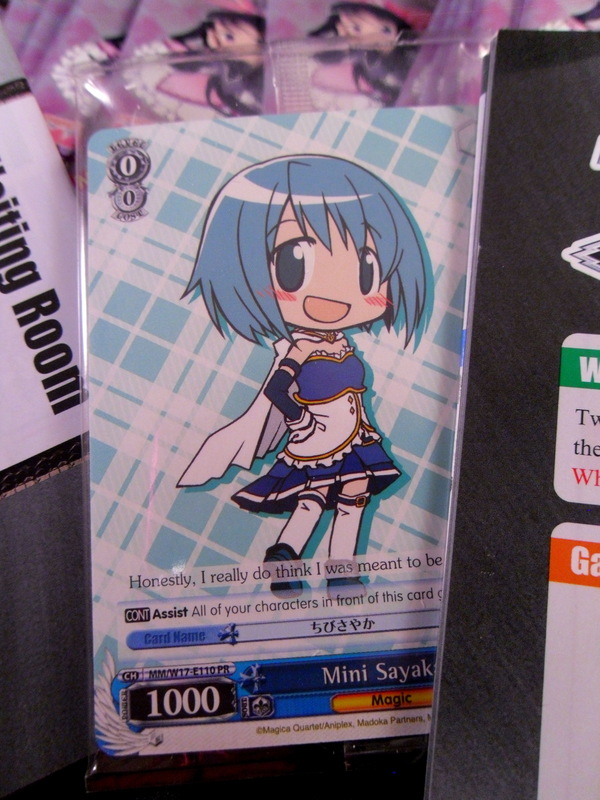 This Chibi Sayaka card is adorable and reflects all that is good in the realm of cardboard entertainment. It doesn’t seem viable as a card at all, but I feel I have to play it. 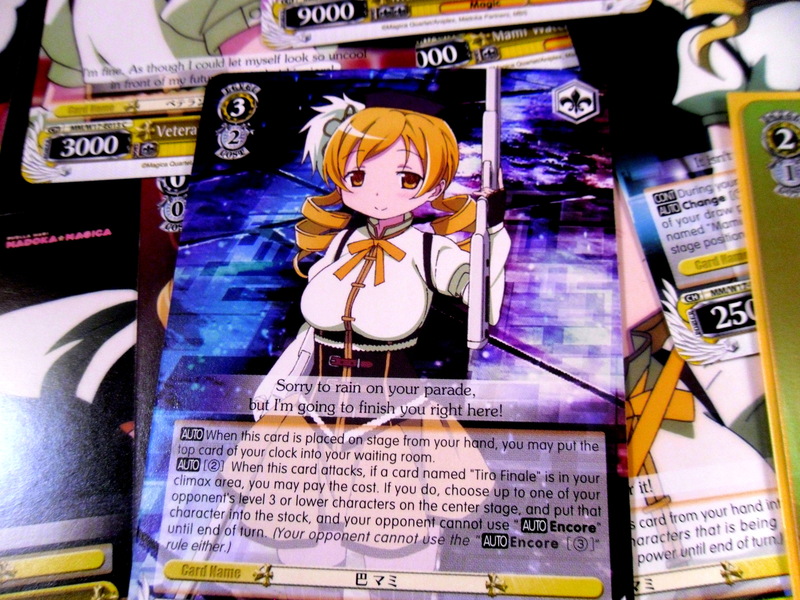 Cards in this game are seemingly split between original art and screenshots from the anime. However, if Yugioh had a lot of “x card” only works with “x card” then this game takes it to another level. Almost every card has an effect triggered only by pairing it up with another specifically named card (that being said the effects are pretty cool). For example, because examples are awesome. 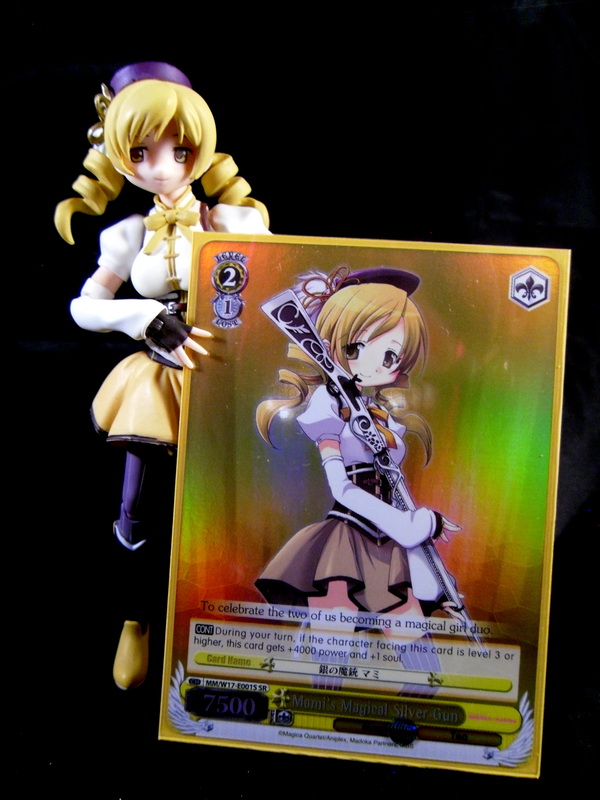 This Mami card for the cost of 2 stock (See Mana, see Ener) can turn your opponent’s character into stock, but only while paired up with the relevant climax card. I pulled a foil and it was this card (shown next to the most relevant of figurines). 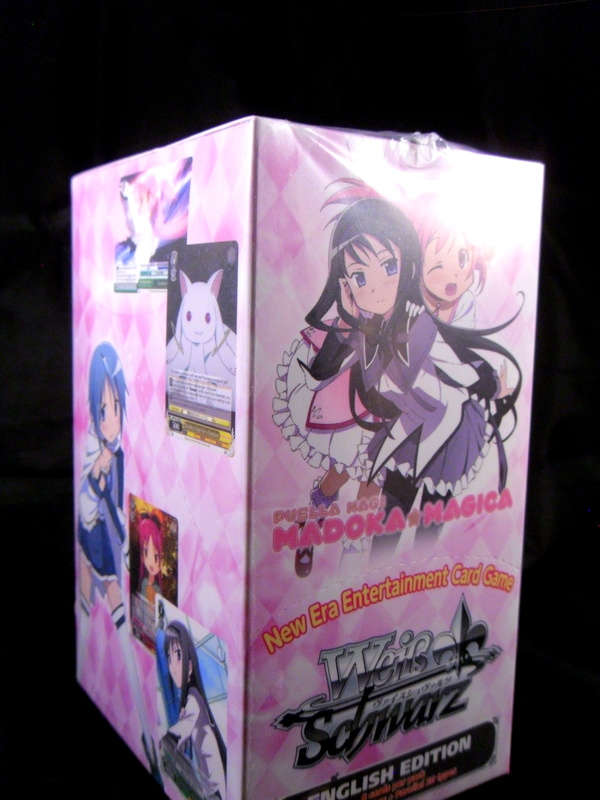 Coming from Yugioh where there are any number of foils in 1 box it was quite shocking to pull one, BUT this is only foil Madoka card I’ve ever pulled or seen so I’m very happy to have gotten it. Did this even matter? Why did I read this?! The only valuable thing I can offer you after this experience is a seal of approval for Weiss Schwarz in general. 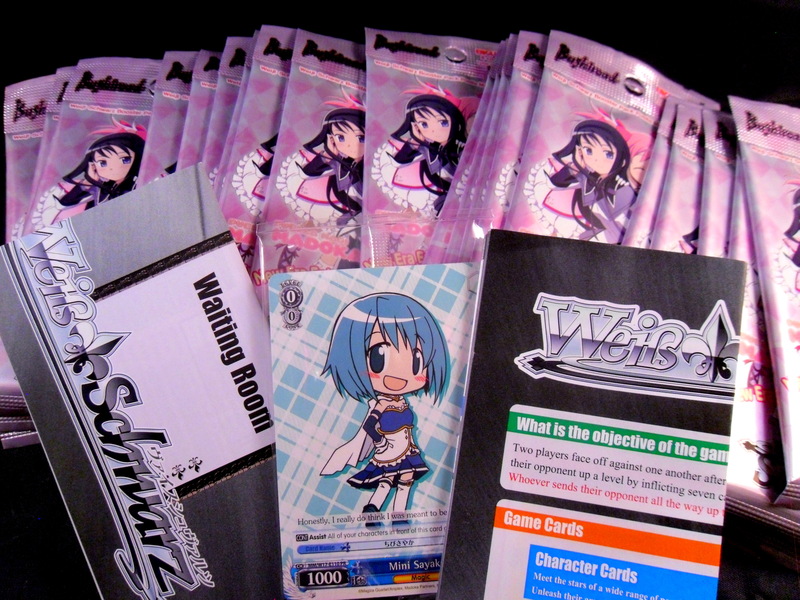 If you are an anime nerd (don’t take offense) who wants to play a card game and Weiss happens to have your favorite show, then no game will give you as much satisfaction to collect/open. Play is another thing as Weiss has, (in my humble opinion) the most convoluted set of rules ever designed. That being said I always leave a Weiss Game win or lose more confused by what just happened than angry/frustrated. 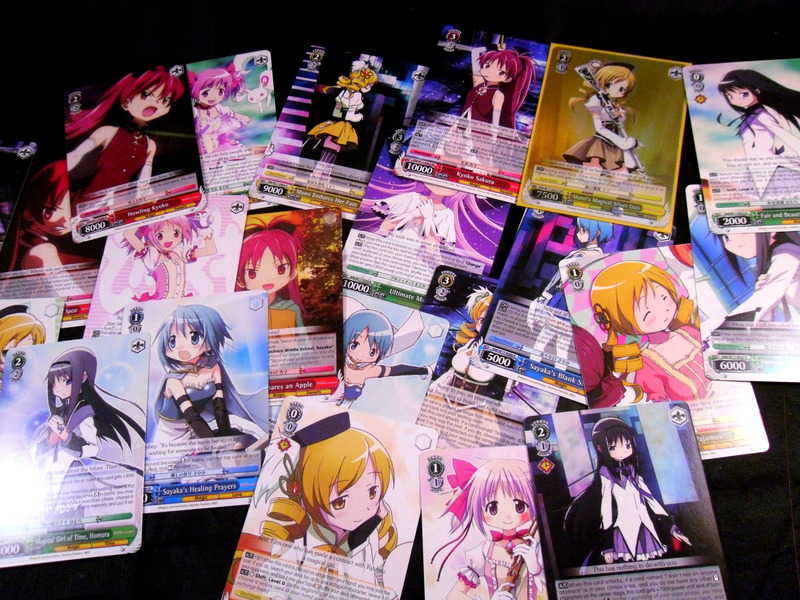 For another example (excuse to post more pictures), a Madoka fan will react very differently to these above cards than a normal card gamer (incidentally Kyubey is so great that he’s also a chibi now too). 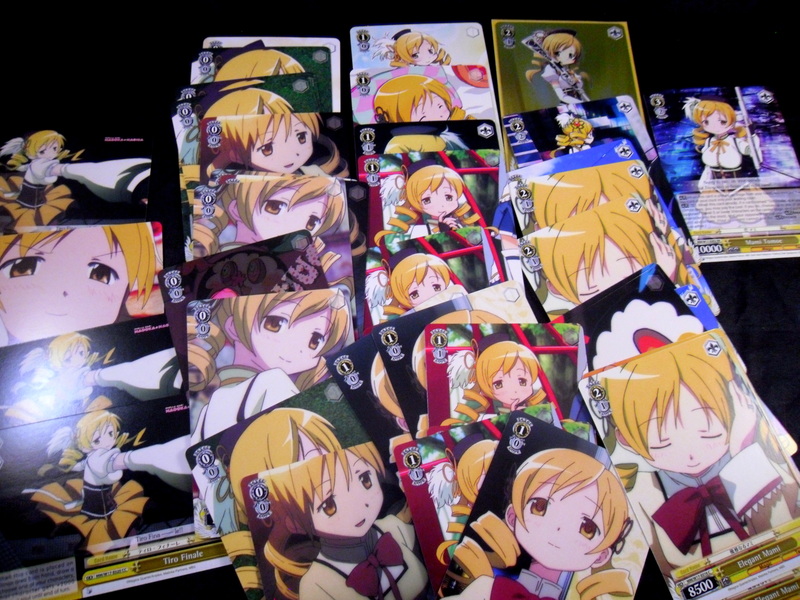 I just want to take this pile of pictures of Mami Tomoe and make it into a deck. I’m probably doing it wrong, but I don’t really mind that much.